There’s been a lot of talk about physical production moving out of California in favor of areas that offer incentives in terms of reduced fees and more favorable tax structures. The success of Breaking Bad has provided a bit of a boom for the local economy. The LA Times reported that, “this summer, a local trolley company began popular tours of the show’s filming locations." 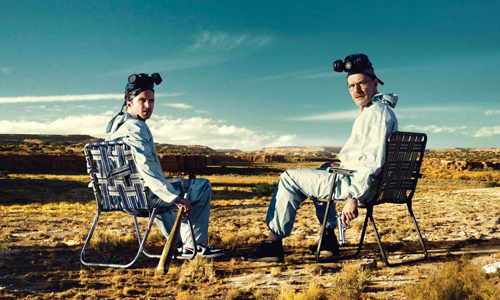 Bryan Cranston & Aaron Paul sitting in New Mexico ... not Southern California. There are numerous other local businesses taking advantage of the unlikely attention Albuquerque has received. Success stories like these have encouraged more communities outside of California to explore ways to lure television and film productions (and the money they bring) to shoot in their cities. Overall production in Los Angeles increased 4.7%. Feature film production increased 3.7%. Commercials were up 14%, thanks largely to an increase in advertising made for the web* and music video production was up 1%. DLP is optimistic that the decline in local filming of TV Dramas will have almost no effect on the content we’re producing. While we’re hopeful that local decision makers can right the ship and keep more productions in Los Angeles, we’re always ready to go anywhere projects take us. We’ve been known to have crews simultaneously spread out from Europe to Hawaii and multiple spots in between. *If you're interested in reading more about the impact web videos are having on production in Los Angeles take a look at this recent LA Business Journal article (link).